Series: EqualLogic. "The sale of this item may be subject to regulation by the U.S. Food and Drug Administration and state and local regulatory agencies. This unit has been used. One hard drive tray is missing. Nexsan PN:CTR-B1G. 2x 10Gb Ethernet Ports / 2x 1Gb iSCSI Ports. Rail Kit Included (screws not included). 2x Power Supplies Installed. 2x Power Cords. Firmware Version 9.0.2 installed. Device photos are representative of item being sold. 16x 400GB 10K SAS Hard Drives Installed. ISCSI Storage. Up for sale is a used HP StorageWorks LeftHand P4300 G2 iSCSI SAN Array w/ 8x HP 1TB 7.2K SAS HDD. 1x HP P4300 G2 Array. Do room for growth, high availability and disaster recovery seem out of reach?. 24 x 900 Gb 10K SAS Equallogic drives. All components are Equallogic. primary copy and the other equallogic array has the backup. This is fully functional Equallogic array with all Equallogic components. 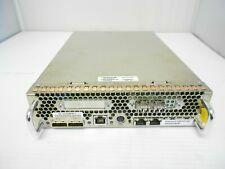 Nexsan E-Series E60 Dual 8GB FC / iSCSI SAN Storage Array (No hard drives installed) Includes Nexsan E60 8GB FC SAN. No hard drives installed. Dual Power Supplies. If you are purchasing a used item, there may be signs of wear but are still useable. Hard Drive(s): 12 x 8TB 7.2K Genuine Dell Enterprise SAS 12Gb/s Drives. Model: Dell PowerVault MD38000i SAN Storage Array. (C) Copright 2008 BTN Systems. The RAID Machine S7316RE is a 16-bay 2-port 10GbE iSCSI RAID subsystem. 16-disk 3U RAID enclosure with 10GbE host connectivity and SAS for expansion. Two 10GbE SFP connectors. Optional flash-based, maintenance-free cache backup. Dell Equallogic. No disk or trays included. We buy retired EMC, Netapp, and Dell Storage! Ask for Nick. Specializing in Netapp, Dell, EMC, IBM, HP and many more products lines. Eliminate storage costs. Nexsan SASBeast SAN Storage System SATA 42 Bay. 42x 450GB 15K SAS Hard Drives Installed (Fully Loaded). 4Gb Fibre Channel / iSCSI Raid 4U. 19TB of 15K Speed! All components are Equallogic. One array has your primary copy and the other equallogic array has the backup. (24) Equallogic 2 Tb NL SAS drives mounted on 3.5" trays. Equallogic takes care of the sizing based on the RAID level you select. 48x 800GB SSD SAS Hard Drives Installed (Enterprise SSD, non-equallogic). 38TB of SSD Storage FAST! New Bulk DELL JFW1P. We're headquarted in Eden Prairie, MN, a suburb of Minneapolis. 14x 250GB SATA Hard Drives Installed. 2 x Dual Power Supplies. The RAID Machine S7212RE is a 12-bay 2-port 10GbE iSCSI RAID subsystem. 12-disk 2U RAID enclosure with 10GbE host connectivity and SAS for expansion. Two 10GbE SFP connectors. Optional flash-based, maintenance-free cache backup. 16x 300GB 15K SAS Hard Drives Installed. 4.8TB Installed (15K Enterprise Level). Storage System has been tested and reset to factory defaults. Part number : N9X16A. Manufacturer : HP. With over 50 years of experience in the IT hardware market, Rhino Technology Group is positioned to provide a cost effective, custom IT solution for any need that may arise. (2x 1gbe rj45 ports per ctrl). Dell Equallogic. 16x 300GB 15k Dell Eql Orig 3.5" LFF. Dell Storage. Dell EQL Orig drives GUI reports No Errors. We buy retired EMC, Netapp, and Dell Storage! Ask for Nick. All components are Equallogic. (24) Equallogic 900 Gb 10K drives mounted on 2.5" trays. (2) 700 watt Equallogic power supplies with power cords. All components inculding the hard drives are Equallogic. 7x 800 Gb SSD 17 x 600 Gb 10K Equallogic drives. All components are Equallogic. One array has your primary copy and the other equallogic array has the backup. Equallogic takes care of the sizing based on the RAID level you select. Hard Drives: 1.75TB (12 x 146GB) 2.5" 10K RPM 6G Dual Port SAS Hot Swap Drives. All of our products are tested and built to custom specifications. The comprehensive solutions include high-quality refurbished and new hardware, system and application software, and an array of in-depth managed services. Nexsan SASBeast SAN Storage System SATA 42 Bay. 4Gb Fibre Channel / iSCSI Raid 4U. 42x 300GB 15K SAS Hard Drives Installed (Fully Loaded). 12.6TB of 15K Speed! HPE PN# B7E17A. Product Model 4330. Hard Drive Interface Serial Attached SCSI (SAS). Processor Speed 2 GHz. Processor Type Xeon. Processor Core Quad-core (4 Core). Processor Model E5620. Number of Hard Drives Installed 8. 96TB (16x 6TB 7.2K ) SAS Hard Drives Installed (Bare Enterprise Seagate or Hitachi). Boardroom Technologies will provide top level service and will do everything in our power to satisfy all your needs. Qty (1) 450GB 3.5" 15K SAS HDD. Qty (15) 300GB 3.5" 15K SAS HDD. Dell Servers. Not for Export. LCD Displays. Product has been professionally tested. Qty (2) Power Supplies with AC Power Cord. Dell Equallogic. 24x 600GB 15K SAS 3.5" DELL Original. Specializing in Netapp, Dell, EMC, IBM, HP and many more products lines. We buy retired EMC, Netapp, and Dell Storage! Ask for Nick. Ask for Nick Charles. Dell Equallogic. 16x 600GB 15K SAS DELL EQL Original. Dell Original Drives - No Errors in GUI. Specializing in Netapp, Dell, EMC, IBM, HP and many more products lines. We buy retired EMC, Netapp, and Dell Storage!